The government of Kenya has offered to lease the entire 50,000 sq. metres office and warehouse space at the Sameer Business Park along Mombasa road for a staggering 2 billion Kenya shillings. The government expects to use it for business process outsourcing a key pillar of Vision 2030. The Sameer Business Park, part of a conglomerate of companies owned by usiness magnate Naushad Meralli has accepted the offer. The development planned on an 8 acre site is expected to be completed by the middle of the year. Government to build ICT city in Malili. 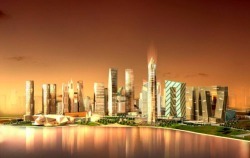 The government plans to build an ICT city in Malili near Machakos. The project is planned on a massive 5,000 acre site the government recently acquired in Malili at a cost of Ksh 1 billion. The project, part of the governments vision 2030 pillars of development is to be undertaken in conjunction with the World Bank and the private sector at an estimated cost of 10 billion USD. However, the site formerly part of Malili Ranch is marred in controversy and allegations of fraud that threaten to derail the project.